We’ve stretched our special offer till the end of November to give you plenty of time to shop at leisure, not just on Black Friday. We’re also celebrating Small Business Saturday on November 25, which encourages shoppers to support small, family-run businesses like ours! Then there is Cyber Monday. While we’re a small business, we have a big online presence. And at Thanksgiving, we like to thank our customers with a bonus discount on our already low prices. A portion of every EuroLuxHome.com sale goes to Pets Inc., a no-kill animal shelter in Columbia, SC. So the homeless pets thank you for your purchase too! The 15% discount code Gratitude is valid on everything from antique French furniture to vintage lighting and new furniture and home accessories for every room in the house. Here are some ideas to tempt you! This dramatic antique French Gothic buffet dates to 1870 and it makes a stunning visual statement. 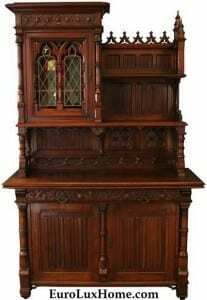 Intricately carved in walnut with a gorgeous stained glass door, the antique French Gothic buffet is a wonderful server for your dinner gatherings and it will also look great as a home bar, to serve your favorite wines, spirits and liqueurs. See all our buffets and sideboards. This set of six antique French Hunting chairs will make a very elegant impression in your dining room. 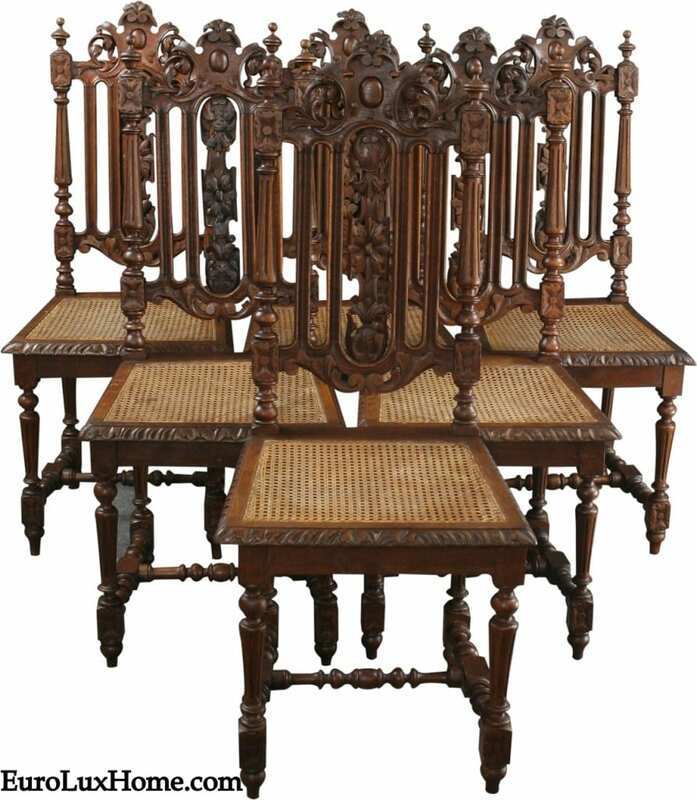 The chairs date to 1880 and they are beautifully carved in solid oak wood with rattan seats. The crest and finials on the chair back are quite grand and they give these fine dining chairs a very noble look. Browse all our new and antique dining chairs. If you are in the market for a new leather chair, we have a wonderful selection of antique-inspired and classic leather chairs in many different colors. This club style chair is just one example. 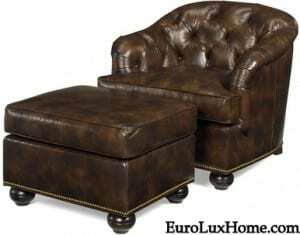 The leather chair is made in the USA and it is crafted in beautiful leather with luxurious tufting on the back. The traditional nailhead trim adds another decorative detail. Comfy? You bet! Browse all our leather chairs here. This hand-painted new Scarborough House Chinoiserie white lacquered chest of drawers is a graceful beauty from head to toe! The curvy serpentine bombe shape, the hand-painted design and the ornate brass accents all add up to make this an exquisite choice. Our collection of new and vintage lighting includes chandeliers, floor lamps, ceiling lamps, wall sconces, table lamps and more! 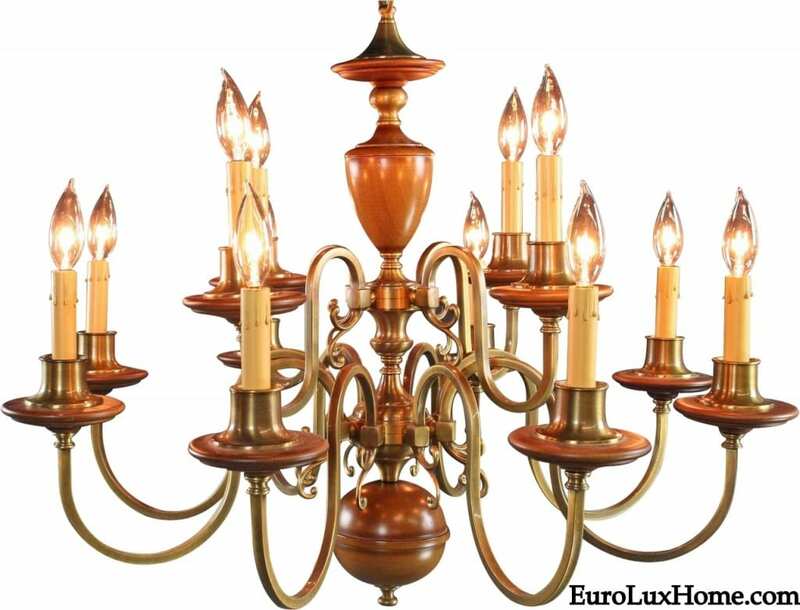 I’ve chosen to show you this large vintage Flemish chandelier because the shape is so beautiful and the wood and brass-toned metal is so handsome. It’s sure to create a warm and welcoming mood in your home. The offer is valid now through November 30, 2017. However you choose to use your 15% discount Greg and I wish you a very happy Thanksgiving and happy home decor and antiques shopping! 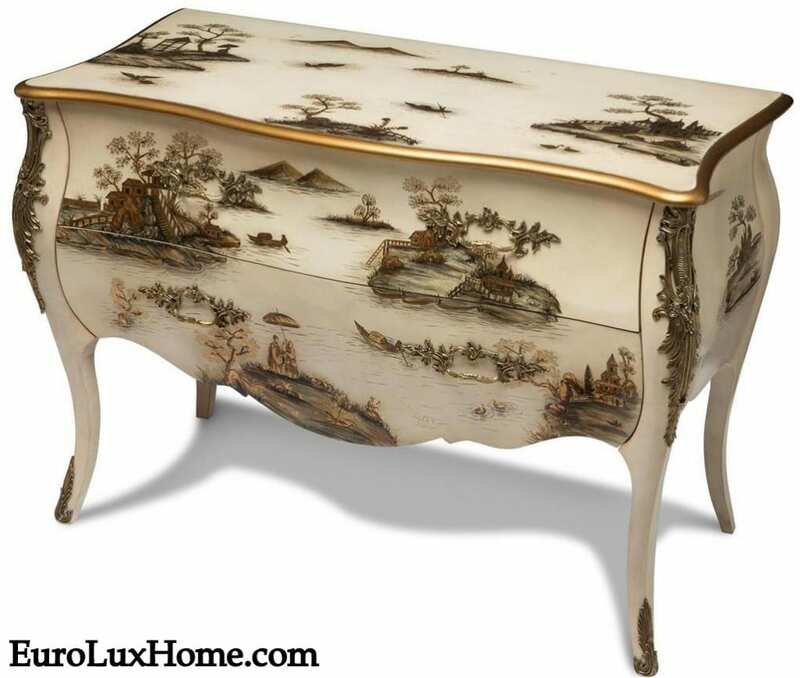 This entry was posted in Antique Furniture, Holiday Fun, News and tagged antique buffet, Antique Furniture, antiques, Antiques Shopping, Chinoiserie, coupon code, discount, French antique dining chairs, French Antique Furniture, holiday gifts, Scarborough House, Thanksgiving, Vintage Chandeliers on November 16, 2017 by admin.